This is a great tent albeit absolutely massive and very heavy (need two to put it up). Definitely advise getting the foot print groundsheet to see where you are pitch wise before getting it all out, had difficulties fitting in one pitch on some campsites. Easy to put up, hand pumps a bit naff so invested in an electric one. Each bedroom I would say will comfortably sleep 3 with airbeds. More than enough living space for rainy days and the 2018 model has an extra door on the porch for a sheltered kitchen area. My only negative about this tent is that it doesn�t have any fly nets. The doors are either open or shut. Bedrooms doors would have been better with a zip in the centre to allow access to both sides when the divider is in. This tent was gifted to us after our beloved Morpheous8 was mercilessly shred to pieces in gale force winds. We noticed that the only tents that survived that stormy night were dome shaped tents. All the tunnel tents were destroyed. Now I know it was extreme weather, but it got me thinking. So we searched for a huge inflatable tent with a dome shaped roof. Pitch: The bag it comes in is HUGE, but surprisingly spacious, making packing up easy peasy! Pitching was a piece of cake. It was so easy to inflate, there are videos on youtube that are worth watching, but the instructions, although basic, did the trick. It took two of us to pitch the tent in approximately 15-20 mins including pegs. On the second pitch the pump broke (it�s not great quality) so we used an electric one. This was quicker and much much less arduous. Structure/lay out: The structure of the tent, with the cathedral roof is amazing, its tall and has a little window to let in some light. It stood proud in the face of challenging weather and had no leaks whatsoever. Its huge; the bedrooms are comfortable and spacious, and the middle area is a good size for rainy day table and a few chairs. Loads of little places to hook lighting or other bits and bobs. The attached porch area is smaller than I would have liked. It makes for a small kitchen area, but it is not well sheltered. Shame there is no extension options. Maybe a few wind breaks will help? It is not a tent that provides much of a view compared to other designs, you would have to sit out in the porch area if you want shelter AND a view. Quality: The bedrooms are much flimsier that other tents we have had in the past. They survived their first season, but only just. If you have children that tend to bounce around a lot in bedrooms, they will tear. I just kept my kids out of the bedrooms until bedtime! The supplied hand pump is rubbish, get an electric one. Overall: Great tent. Brilliant for space, sturdy and reliable thanks to its unique design. 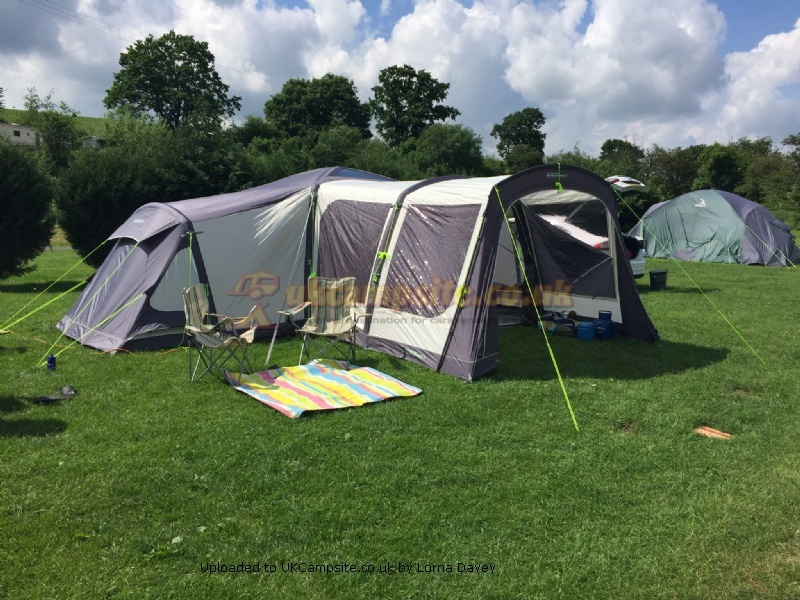 At the time of purchase this was the only inflatable tent on the market with a dome roof. We are happy with our tent and looking forward to our next trip. Add your review of the Airedale 12.0! The Airedale 12.0 is the largest in the range and it is certainly that. It is a pod tent which has three sleeping pods all suitable of sleeping four people. It is designed to sleep twelve people and has a fantastic living area inside because of its unique shape, ideal for large groups. The Airedale 12.0 is made from the high performance 100 Denier Polyester and is printed with a hex print to give it a modern, dynamic look. 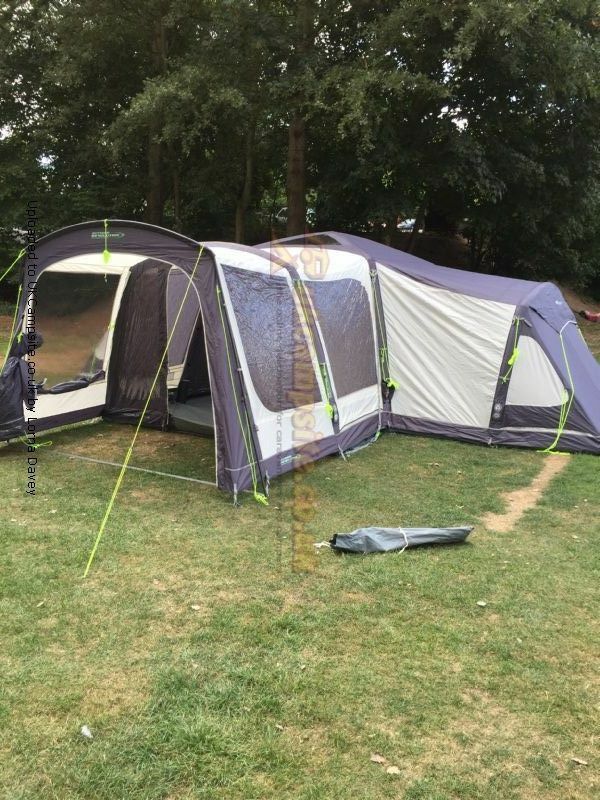 It has a sewn in groundsheet and comes complete as one unit with its six Oxygen Air Frames fitted. The six Oxygen Air Frames are fitted with the Dynamic Speed Valve and the Intelligent Frame Relief Valve. The Dynamic Speed Valve is the quickest and easiest valve on the market and combined with the exclusive Relief Valve creates the optimum Air Frame on the market. The central tube is a revolutionary welded tube, however the front canopy and bedroom tubes are all individual. The tent has a permanent sewn on canopy using a single pole. It is the perfect addition to this tent as it protects the front of the tent from driving rain. The Tintz Tinted Windows reduce the glare from the sun whilst allowing the sunlight inside, creating a superb relaxing environment for you to enjoy your holiday. The windows all have zip in curtains which are printed with a maple leaf design, and provide privacy in the tent when it is required.